Famous Last Words 11/15: Is it supposed to do that? You are here: Home / GameWyrd / Famous Last Words / Famous Last Words 11/15: Is it supposed to do that? One of the great side effects of collecting so many famous last words from so many gamers was that it was easy to notice how often we understood each others in-jokes and references. There’s a collective wisdom across so many games; from D&D, to Cthulhu to Warhammer, etc. I think it’s also fair to suggest there may be a common mindset that we’re able to make the most of. DM: As you touch the altar, you suddenly feel your hand get sucked inside by its unholy power. PC: Um, sir, where’d you get that odd looking wolfskin cloak? PC: Can I tell anything else about it from here? DM: No it’s far away. PC1: Theres cheese down the barrel of my shoulder cannon. NPC: can i have it? PC1: How many men have we lost? PC2: (casts Fireball) About 12 now. PC1: WHY DID YOU DO THAT?! PC1: Cool! I’m taking them! Player : Well, that stupid dragon ate my sword, so… I walk up to him and KICK him real hard! Hey Guys! Have you seen the other half of my head? PC: I pull out my long sword with +3 damage. DM: The Dragon just spewed fire at you and started your sleeve on fire. PC: I beat at the fire with my sword. PC1: I don’t feel so well. [ down to 5 HP]. PC2: Maybe this staff I found will heal you. DM: The figure of a beautiful woman appears in the magic mirror. She says that she will give immortality and endless power an wealth to anyone who steps through the mirror and joins her. Hey, you could make her one of your sub-wives. DM: The dragon raises its paw in a sign of friendship. PC1: I raise my sword. PC: I look around the library for a way in. DM: You find what looks like a laundry chute. PC: Alright, i slide down it. Pc: I have my ogre breakdown the door, Tulavin wil make a diving role into the chamber with the cultists, both swords drawn and attack the nearest two cultists while Teralin covers him with his bow outside the room. DM: Say, was’nt Teralin your ambidextrious, wardancer specialized in close combat fighting with two weapons, and Tulavin the bow specialist??? Tas: There’s a door at the base of the dragon? I’m going in! Riverwind: No, you’re not…get back here now! Riverwind: …the dragon’s fake, and Tasslehoff is inside. Wicker Dragon (with Tasslehoff’s voice): I am the Great Dra-GON!!!! Tanis: We have to distract him! He’ll find Tas! Raistlin: Pyrotechnics spell on the bonfire!! DM: Flaming fireworks and darts suddenly erupt from the bonfire, commanding the attention of the draconians as the wind drifts the sparks settle to the wicker dragon, seting it afire. (PCs 1&2 are walking along a corridore in the dark. 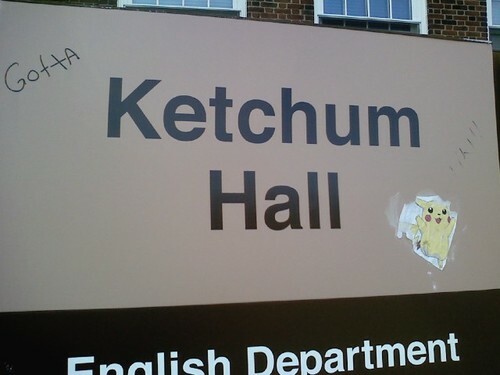 Geek Stuff Gotta Ketchum Hall! 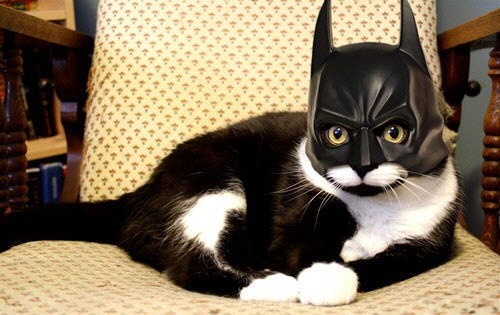 Geek Stuff Batcat is bat cat!